Immunisation is when you are given a vaccine to make you immune or resistant to an infectious disease. Vaccines stimulate the body's own immune system to protect you against specific infections or diseases. According to the World Health Organization (WHO) immunisation saves between two and three million lives a year. You can protect your children from harmful diseases by visiting your nearest health facility for free vaccinations - it's one of the most cost-effective health investments you can make. Many children in South Africa are HIV-positive, which makes them especially vulnerable to infectious diseases. Immunisation provides the most effective means through which parents can protect their children against serious but preventable diseases. Children who haven't been immunised are at high risk for infection. Immunisation provides the most effective means through which parents can protect their children against serious but preventable diseases. Children who haven't been immunised are at high risk of becoming infected with these diseases. What Diseases Do Children Get Vaccinated Against? Polio: Polio is caused by germs that attack nerves, causing weakness or paralysis of the leg and/or arm and if severe, may involve the respiratory or breathing muscles. Measles: Measles causes a high fever, red eyes, coughing and a rash, and can lead to diarrhoea and dehydration, deafness, eye complications, pneumonia, brain damage and even death. Bacilles Calmette Guerin (BCG): Prevents Tuberculosis (TB). Meningitis is a serious disease that can affect people of all ages. Those that get TB suffer from coughing for a long period of time, chest pain, sweating at night, weight loss and even death if left untreated. In young children, the TB germ may infect the brain and cause meningitis, or it could also enter the blood and spread to other parts of the body. TB can kill young people. The best protection for young children for diseases caused by the TB germ is the BCG vaccine. Usually babies who aren't given the BCG vaccine at birth will be immunised when they are taken to the clinic for their next immunisation visit, at six weeks of age. Any baby under one year who didn't get the BCG vaccine at birth must be taken to the nearest clinic, where the vaccine will be given. Babies infected with HIV, who are sick and showing sign of AIDS, mustn't get the BCG vaccine. The Western Cape Department of Health also vaccinates against Rotavirus (one of the viruses that cause diarrhoea) and Pneumococcal disease (for example, meningitis, otitis media, pneumonia and bacteraemia). 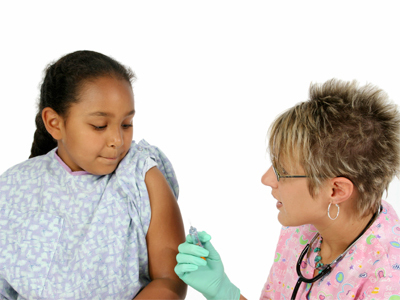 When Must Children Be Vaccinated? 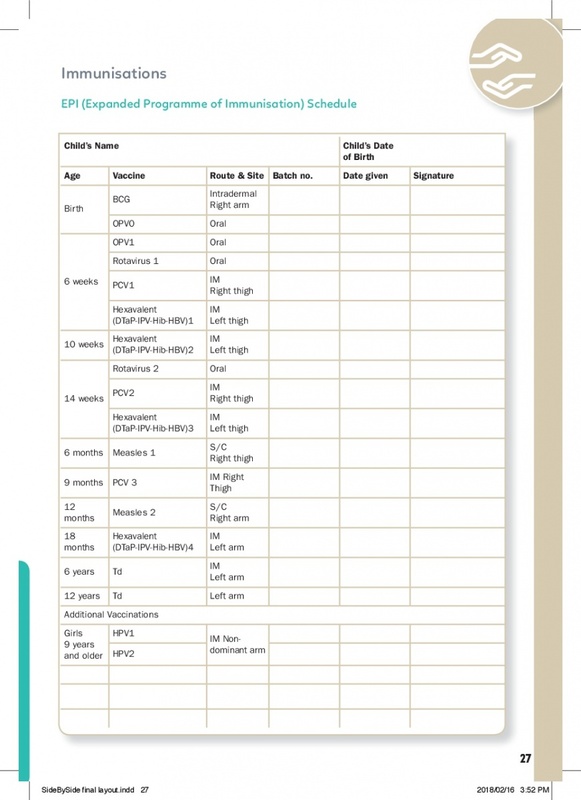 You can download the full periodic programme for immunisations here. Immunisation is available at all primary healthcare clinics and centres as well as secondary and tertiary level healthcare facilities. Always take your child's Road to Health Chart/Booklet to the clinic with every visit to ensure that all the immunisations are up to date. What Vaccination Services Are Available? Vaccinations are available throughout the year, at all public primary health care facilities and centres. During Child Health Season, usually between April and June, the Western Cape Department of Health enables mobile teams to visit creches and day care centres throughout the province, ensuring that children get vaccinated, and administering catch-up doses. Special campaigns focusing on vaccination runs throughout the year. This includes the Influenza Vaccination Campaign (from April to June). All the vaccines on the routine schedule RTHB Immunisation Form are free of charge at all public primary health care facilities and centres. Always take your child's Road to Health Chart/Booklet to the clinic with every visit to ensure that all the immunisations are up to date.